At Keuka Studios, we custom design and fabricate cable railings such as deck railings and stair railings. You can choose from our standard designs or work with our designers for a completely custom cable railing. We offer all of our railing systems in surface mount or fascia amount. In addition, you can customize the railing materials to fit your unique project. We also use recycled materials whenever possible. While we design and manufacture our railings in the U.S., we can ship worldwide and have worked closely with clients in several countries. We manufacture both commercial and residential railings. Send us your architectural drawings, or just a sketch, and we will work with you to create the perfect look and feel for your railings. Using 3D CAD modeling we build detailed drawings and realistic renderings of the finished project. This assures that your new railing looks perfect with your existing architecture. Read here to find out more about our design process. 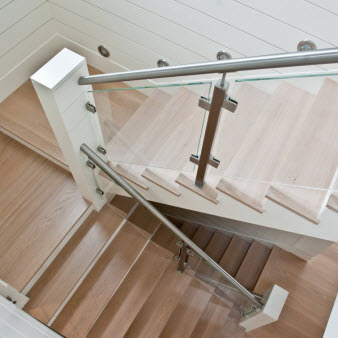 In addition to cable railings, Keuka Studios designs and builds custom stairs. Below, you can learn more about our signature cable railing styles. View Ithaca Cable Railing Ithaca Cable RailingThe clean, simple lines of the Ithaca Cable Railing make this an unobtrusive, yet sturdy railing option, letting you take in more of the surrounding view. View Keuka Cable Railing Keuka Cable RailingOur trademark style, the Keuka Cable Railing cuts a bold figure with a maritime feel. The elegant curves make this an ideal choice for curved decks or balconies. View Chicago Cable Railing Chicago Cable RailingInspired by the mid-twentieth century American design of Chicago’s famous John Hancock Center. The Chicago Style is an excellent railing choice for stairs, decks and balconies. View Tokyo Cable Railing Tokyo Cable RailingThe sharp, clean lines of our Tokyo Style Cable Railing offers a graceful complement to stairs or decks. The minimal profile highlights the views surround the architecture, providing a seamless integration between spaces. View Prairie Cable Railing Prairie Cable RailingThe Craftsman-inspired Prairie Style Cable Railing boasts strong lines and deco-style cutouts and can be surface or fascia-mounted. These railings are a beautiful testament to the craftsmanship that made the Arts and Crafts movement timeless. View Custom Railings Custom RailingsIf these styles don’t quite fit your existing architecture, or you have something else in mind, we can make railings or stairs for you, too. We want your railings and stairs to be perfect, so we’re happy to work with you to find the right look for you. Carbon steel posts with a powder coat finish of your choice. Our powder coating process includes a commercial grade sandblasting, iron phosphate bath, zinc rich primer and two coats of the polyester top coat. We have standard powder coat color choices as well as thousands of different custom powder coat color choices. Powder-coated carbon steel is the most economical material option. Perfectly suitable indoors or outdoors, although not recommended for oceanfront. Ideal for coastal areas, hot dip galvanizing provides excellent protection from corrosion due to humid and salty sea air. The thickness of the galvanized coating will depend on where these railings will be installed. Hot dip galvanized and powder coated steel is an excellent option for pool or swimming enclosures and ocean front properties. Hot dipped galvanized railings are a durable, low-maintenance option for marine and humid environments. Powder coating on top of galvanized steel allows you select the color of the post. If the powder coating is ever chipped it will be protected by the a hot dip galvanized layer underneath. For improved resistance to corrosion, all aluminum finishes are powder coated or clear anodized. Powder coating aluminum will allow you a variety of color options. Clear anodizing the aluminum requires brushing the material with a #4 brushed finish before final clear anodizing is applied. Clear and brushed aluminum has a similar look to stainless steel for much less cost. Some designs not available in aluminum. We offer stainless steel in a variety of stainless finishes. Brushed Finish (#4), Fine Brushed Finish (#6), Matte Finish (Bead Blast), or a Mirror Finish (#8). All stainless steel receives passivation to assist in corrosion protection.